Photo/ANDREW GRIMM Harrison Central’s Kobe Mitchell, left, looks to break loose from a pair of Steubenville defenders during Wednesday’s game. CONNORVILLE — Harrison Central is by no means the deepest basketball team around. 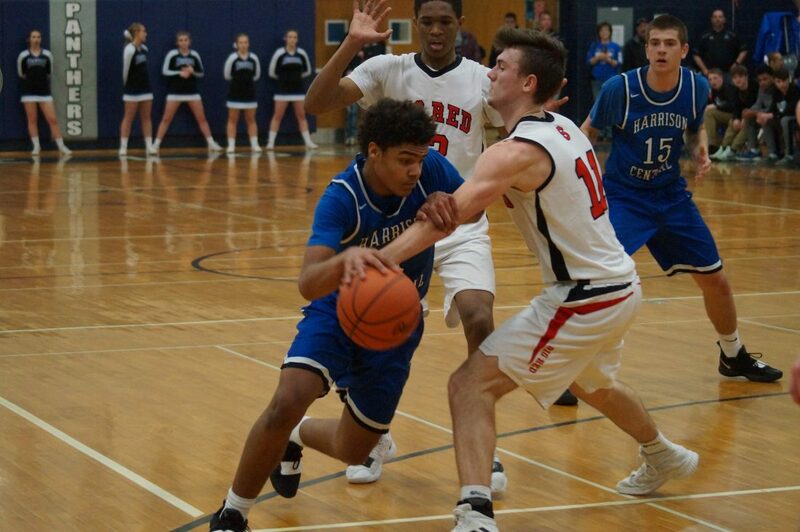 When its bench got even shorter with two minutes to go in the first period when senior guard Caden Dalton went down, with an apparent arm injury that didn’t allow him to return to the game, Steubenville put its foot down on the pedal even harder. Big Red, which loves to force the issue and dictate tempo with its full-court attack, simply suffocated the Huskies with length, athleticism and size and it resulted in a convincing 64-47 victory in front of a large and loud crowd at Buckeye Local High School Wednesday evening in the Division II Eastern District semifinal. What Big Red needed to do was simply be themselves. Eight different players scored for Steubenville, which is now 18-5 and will take on John Glenn Saturday night in the district championship game. Big Red forced 14 turnovers and held a 33-18 edge on the glass. Big Red took command of the game in the second quarter when they outscored the Huskies 21-11. Calvin Bickerstaff, who had 12 points in the game, had half in the second, including an impressive two-handed dunk in transition. The Huskies were kept in it by sophomore dandy Kobe Mitchell. He scored 11 of his game-high 32 in the second quarter. Actually, he scored 16 straight points at a juncture for Harrison. Harrison (17-7) got within 10 at the final stop, but could only get as close as nine at any point in the second half and that came after a brief 5-0 spurt in the third. Seemingly each time Harrison would be gaining some traction, Steubenville got a stop and score to thwart any possible Harrison run. Steubenville erased any doubt of the eventual outcome moments in the fourth when it scored the first five points of the fourth. Despite only one field goal in the fourth, which was a trey by senior Jordan Wallace, Big Red still outscored Harrison, 12-7, in the fourth. They converted nine-of-14 at the foul line. One bright spot for the Huskies was the play of Mitchell, who is an all-Ohio candidate. The Eastern District’s Player of the Year scored 32 points, which allowed him to finish half of his prep career with 1,001 points. He hit the coveted barrier with a free throw in the fourth quarter. Only two other Huskies (Payton Taylor and Gavin Muckle) scored more than two points and they went for four and five, respectively. Steubenville was paced by Zimmerman and Josh Zimmerman’s 12. James Roundtree added 10, while Jorian Jones battled his way to eight points and a game-high 11 rebounds. Big Red’s game against the Lil Muskies will be held at Claymont High School Saturday night at 7. John Glenn dispatched St. Clairsville, 70-52.